Do you wonder what it is? Maybe you read about Jen Bracy's Eating Local Guide in the Oregonian or maybe you've seen her selling them at the downtown PSU Portland Farmers Market or seen them for sale at New Seasons Market. Jen was nice enough to drop off one of her handy and inspiring guides for me a couple weeks ago and here's the scoop. "The guide consists of monthly cards highlighting seasonal foods and presenting ideas for how to prepare and preserve them. The format is flexible, allowing individual cards to be carried to the market and used in the kitchen. 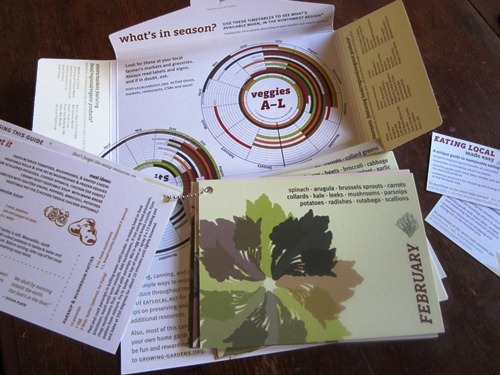 The monthly guide package includes a plethora of resources and links [from CSAs to farmer’s markets to local businesses & restaurants to gardening and preserving tips] as well as timetables showing what produce is in season." 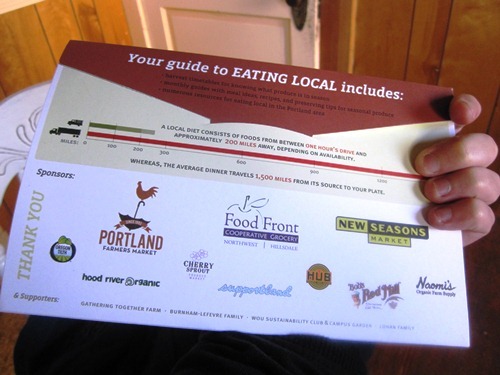 If you'd like to purchase one of Jen's guides she will be talking about and selling her Eating Local Guide and posters at the downtown PSU Portland Farmers Market June 23, July 21 and 28. The guides are also available for purchase at New Seasons Market, Bob’s Red Mill, Food Front Cooperative Grocery, Naomi’s Organic Farm Supply, Cherry Sprout Product Market & City Farm. Eat local!